ExoRover 'Bryan' shows off his eco-friendly chassis at the unveiling of the new ESA Mars Yard in Stevenage (ESA). 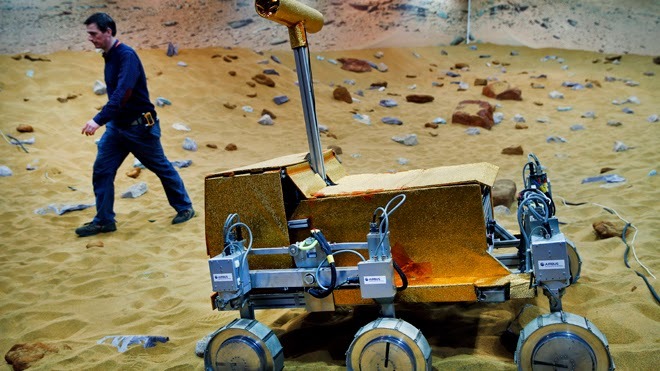 01 April 2014 - Stevenage, UK - The opening of the European Space Agency’s (ESA) “Mars Yard” today was celebrated as an important step by ExoMars, a joint endeavour between the agency and Russia’s Roscosmos, in their effort to send a rover to the Red Planet in 2018. The European Mars rover, also unveiled, is designed to drill beneath the surface of the Red Planet searching for signs of life. It's been dubbed 'Bryan' by its creators - earlier versions were named Bridget and Bruno.